The volunteer team of Dover’s RNLI lifeboat claimed a huge thanks to members of the Phoenix az Angling Club when a cheque for the grand sum of ₤ 1177 was provided on-board the terminal’s Severn Lesson lifeboat City Of London II on Sunday morning. They raised the cash through a number of events consisting of an auction, a real-time music conference and also a collection outside the regional branch of Morrisons. Over the years the club has actually now contributed over ten thousand extra pounds to their regional lifeboat as well as its volunteer staff. 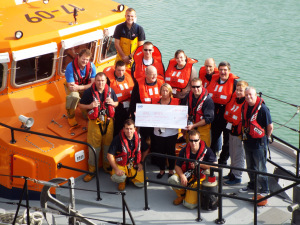 The cheque was approved by Dover’s 2nd Coxswain James Clapham as well as participants of the lifeboat team. Dover’s Lifeboat Operations Supervisor, Roy Couzens claimed that without donations such as these from organizations as well as participants of the local area the Royal National Lifeboat Organization would cease to already existing, so in support of the team as well as the Dover branch I wish to claim a big thanks to the members of the Phoenix Fishing Club for their continuous assistance.